When former Fox News anchor Gretchen Carlson complained to then-CEO Roger Ailes about hazing from her male co-workers, he replied with even more harassment, according to a lawsuit she filed. “I think you and I should have had a sexual relationship a long time ago, and then you’d be good and better and I’d be good and better. Sometimes problems are easier to solve,” he said, according to a complaint she filed in New Jersey Superior Court in 2016. The high-profile case eventually caused Ailes’ to be ousted as CEO and chairman of Fox News after 20 years. The only reason anyone outside of Fox knows about it? Carlson filed a lawsuit, instead of going through the secret process of arbitration. “We wouldn’t know anything at all” about Ailes’ behavior and subsequent harassment cases at Fox if Carlson had been forced into arbitration, her lawyer Nancy Erika Smith told ABC News. Smith made the risky move of filing suit against Ailes personally, rather than the company. Gretchen Carlson attends SiriusXM’s ‘Leading Ladies With Gretchen Carlson’ hosted by SiriusXM host Randi Zuckerberg at the SiriusXM studios in New York City, Dec. 12, 2017. On Thursday, one week after a global walkout of 20,000 Google employees, vendors, contractors and temp workers protesting the company’s handling of sexual harassment and general equity cases, the tech company became the latest to reverse course and eliminate forced arbitration in cases of sexual harassment and assault — fulfilling one of their demands. In doing so, Google joins Microsoft, Uber and Lyft in waiving forced arbitration in sexual harassment and assault cases, despite a Supreme Court ruling in favor of mandatory arbitration earlier this year. Many employee advocates argue that ending forced arbitration, which usually imposes confidentiality on the parties involved, is the first step toward ending sexual harassment in workplaces. Arbitration is a process outside of the court system that is common in American corporations. Instead of filing documents in court — which become part of the public record — and moving toward a jury trial, the outcome is decided behind closed doors and often included as a term for employment. Employers favor arbitration because it often limits bad publicity and the amount of money in awards an employee will receive. Also, because the employer often wins. 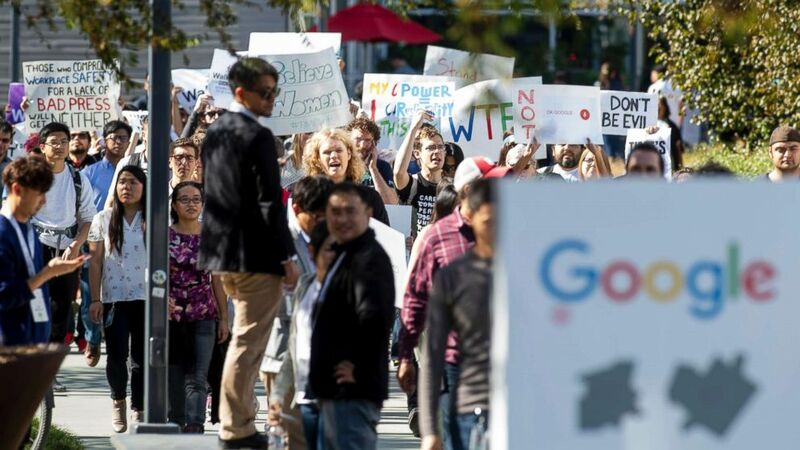 Google employees chant during a “women’s walkout” at the Googleplex offices in protest over the company’s handling of alleged sexual misconduct at the company in Mountain View, Calif., Nov. 1, 2018. Another thing that tilts the playing field toward employers is numbers. Arbitrators are staffed by companies, whose clients are corporations. Out of, say, 10 potential arbitrators, each side can nix a few and then rank the remaining to oversee their dispute. “Employers are repeat players in the way that individual employees never can be. They get to know lots and lots about arbitrators. If you’re an arbitrator that rules for me this time, probably I’m going to nominate you next time. Employers can structure the agreements to make it likely the pool of arbitrators selected are employer-friendly — it’s like picking your jury,” Mortenson said. In harassment and discrimination cases, there’s another factor: demographics. “Arbitrators tend to be white men over 40 who come from a corporate or management background,” said Doug Wigdor, a labor lawyer and arbitrator. He represented women who were sexually assaulted by their Uber driver. Though Wigdor and Smith noted the progress made by allowing employees to sue for sexual harassment and assault, they also said it’s just the beginning of a longer process.